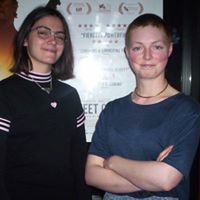 Last week’s screening of A Fantastic Woman, was preceded by a screening of our current BRIT School Showcase short A Bright Girl She Was, and a short interview and Q&A with its directo r Nancy-Belle Hannah-Griffiths (on the left of the picture), ably conducted by the Campaign’s Youth and School’s Coordinator Alex Tyler. Nancy-Belle is in her last year at the BRIT School. She apologised for the dark theme of the film, but promised that the short she is working on as her final year project concerning the downside of social media, will have an upbeat ending! Hopefully we can screen it at the David Lean in the future. May’s BRIT School short is Living with Autism, a thoughtful film about how a mother deals with her young son’s condition. Everyone was most impressed by A Fantastic Woman, a subtle portrayal of the transgender experience. Finding Your Feet proved very popular – there’s another screening on Wednesday, at the time of writing only one ticket remains.